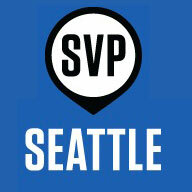 SVP Fast Pitch is the region’s premier competition igniting social innovation. This year, over 100 organizations applied and we are proud to report that EndBrainCancer / Chris Elliott Fund made it as a quarterfinalist! SVP Fast Pitch is produced by Social Venture Partners (SVP), the world’s largest network of engaged philanthropists and the event is almost entirely run by over 100 dedicated volunteers. Volunteer coaches have been helping Dellann Mydland and The EndBrainCancer Initiative improve our pitch. On October 27, the best innovators pitch live at McCaw Hall in Seattle Center before an audience of nearly 1,000 philanthropists, investors, and community leaders. A general admission ticket costs $125. The ticket price includes great networking, entertainment (e.g., the inspiration pitches), food and wine, and, most important, funding the prizes for the non-profit winners. A large portion of your ticket cost is tax deductible. You may register online.